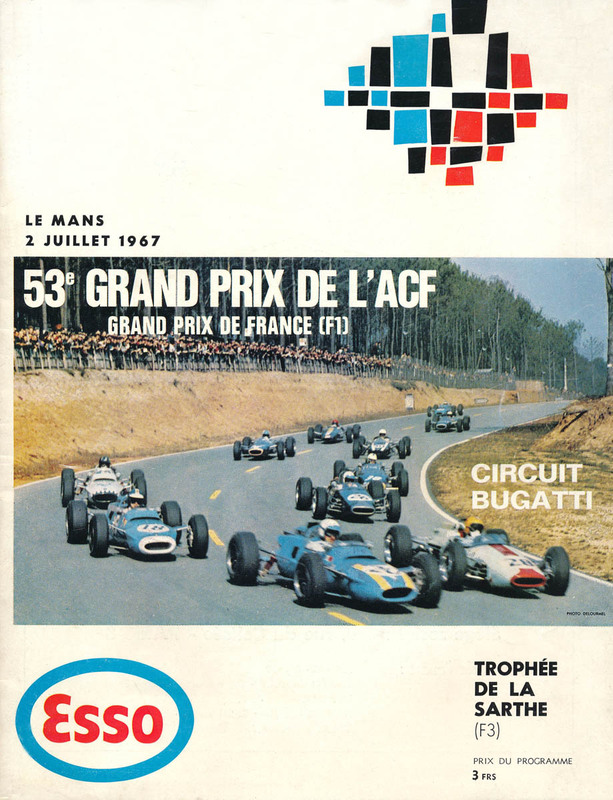 The 1967 French Grand Prix was a Formula One motor race held at the Bugatti Circuit, Le Mans on 2 July 1967. It was race 5 of 11 in both the 1967 World Championship of Drivers and the 1967 International Cup for Formula One Manufacturers. The race was the first French Grand Prix to be held in Le Mans since the first ever running of the race in 1906, and as of 2019 is the only time the Bugatti Circuit has been used for the Grand Prix, though the circuit continues to host the French motorcycle Grand Prix. The new Bugatti circuit used the main pit straight at Le Mans, which back in 1967 did not have the Dunlop Chicane, but then turned right at "La Chapelle" into an infield section comprising the third gear "Le Musée" left hander and the second gear "Garage Vert" corner which led onto the back straight, whose only distinctive feature was the "Chemin Aux Boeups" left hand kink (now a left-right chicane) some two-thirds along, before heading back to the pit straight via the "S Bleu" and "Raccordement" corners near the entrance to the pits. The Bugatti circuit was seen as somewhat boring and was universally unpopular with both drivers and crowds, with only a reported 20,000 attending the race. Some of the drivers were reported to have privately wished the race was run on the full 13.461 km (8.364 mi) long Circuit de la Sarthe, where the 5.7 km (3.5 mi) Mulsanne Straight was 1.3 km (0.81 mi) longer than the entire Bugatti circuit. At the time, circuit lengths of 10 km (6.2 mi) or longer were common in Grand Prix racing, including the 14.120 km (8.774 mi) Spa-Francorchamps used for the Belgian Grand Prix and the 22.835 km (14.189 mi) Nürburgring used for the German Grand Prix, so many drivers felt that using the full 24 Hours circuit should have been considered as the venue by the Automobile Club de France. Graham Hill was on pole and led away for the first lap until Jack Brabham took over. On lap 7 Jim Clark took the lead and Hill passed Brabham to make it a Lotus 1-2. Hill then retook the lead until his crown-wheel and pinion failed on lap 14. The same problem caused Clark's retirement from the lead on lap 23, leaving Brabham ahead of Dan Gurney, Chris Amon and Denny Hulme. On lap 41 a fuel line broke on Gurney's car, making it a Brabham 1-2 and Amon's throttle cable broke several laps later. Brabham drove home serenely to win his first race in eight Grands Prix by 49.5 seconds from teammate Hulme, and over a lap in front of the BRM of Jackie Stewart. ^ "Motor Racing Programme Covers: 1967". The Programme Covers Project. Retrieved 20 October 2017. ^ "1967 French Grand Prix". formula1.com. Archived from the original on 19 February 2014. Retrieved 26 September 2015. ^ a b "France 1967 - Championship • STATS F1". www.statsf1.com. Retrieved 15 March 2019. This page was last edited on 15 March 2019, at 11:56 (UTC).